We had an early dinner this evening, which provided me with the opportunity to mate the stab with the fuselage. I cut two idenical stab mounting plates out of some good 1/16" Birch plywood. These plates are 1.25" wide and 3.20" long. 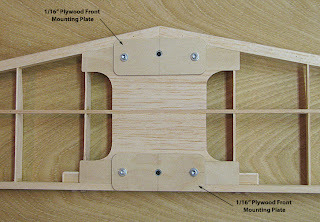 Matching holes were drillied for 4-40 Allen head screws as shown below. In addition, 0.22" diameter holes were drilled to match the locations of the two 2-56 Cap screws and washers used to secure the fin as shown below. These holes permit the stab to fit flush on the plates with fin in place. 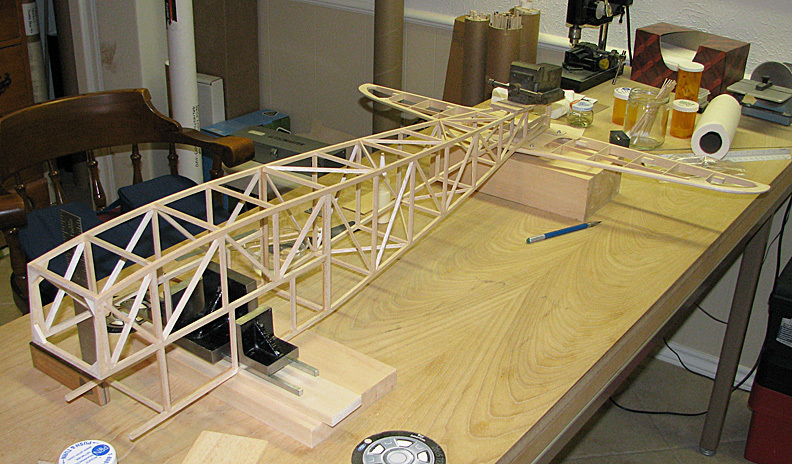 The fuselage was turned upside down and the two top longerons under the wing saddle were weighted down on balsa blocks with three steel squares resting on two 1/4" steel rods as shown below. 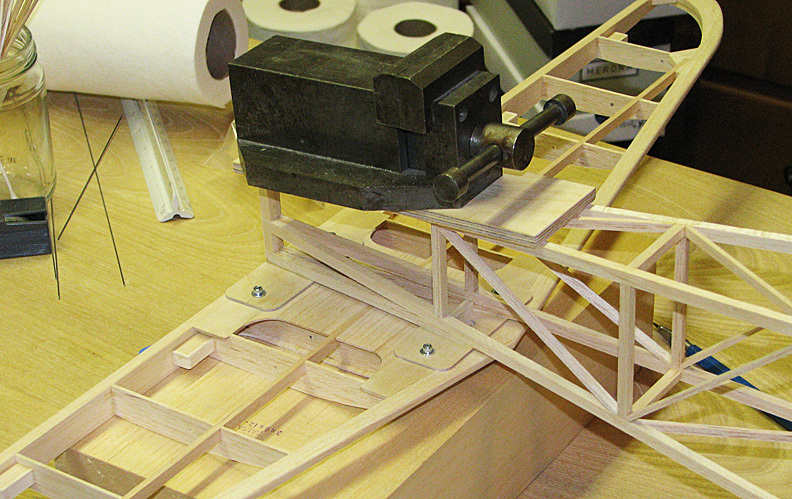 Notice the fuselage sides were checked for squareness with the carpenter's square as shown below. 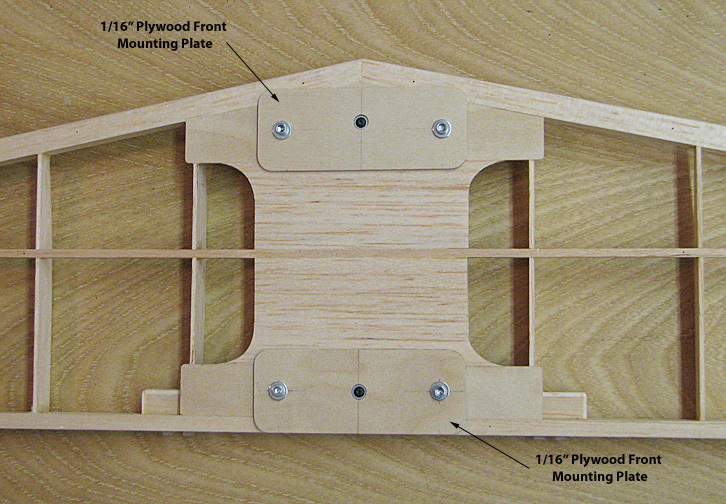 This set up established the reference plane for mounting the stab. The stab with the mounting plates attached was also turned upside down and placed on a large balsa block shown below. 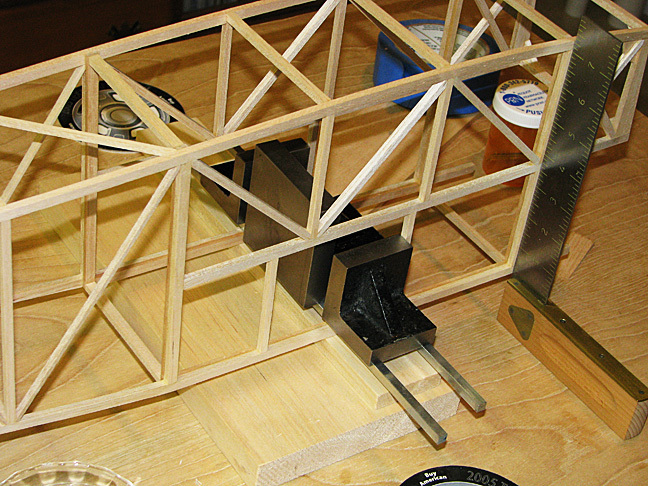 A series of measurements were made to position the stab for gluing. The straight bottom of the stab rear spar was measured on each side relative to the work table be sure the it was parallel to the plane of the work table. 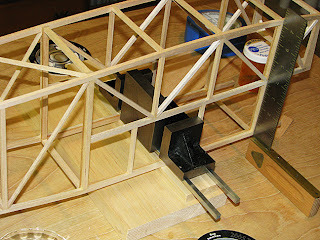 Then diagonal measurements from the rear tips of the stab spar up to the front corners of the fuselage were made and adjustments were made until both diagonals were equal. Then the two plywood mounting plates were carefully marked along the outside of the longerons. The stab was removed and aliphatic glue was applied to the plate's contact areas.